The ASEAN Food Composition Tables contain food and nutrient data which were systematically compiled from six ASEAN national food composition tables. 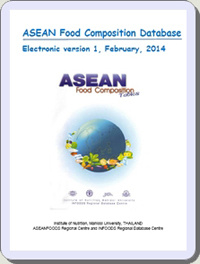 This publication generally provides average nutrient data on food consumed in ASEAN countries. It aims to present “typical” values for use when analysing the diet of groups of people, rather than that of individuals. Copyright © 2012 Institute of Nutrition, Mahidol University. All rights reserved.